On August 1, 2018, the 20th episode of National Polygamy Advocate ™ Mark Henkel's past media interviews was posted to a new, historic, official podcast. Back on March 21, 2018, starting with non-public testing, the podcast posted its first episode and subsequently aired more past media interviews every Wednesday thereafter. Over those initial-testing weeks, Apple iTunes, GooglePlay for Android, and several other podcasting platforms all picked up the podcast on their separate platforms. 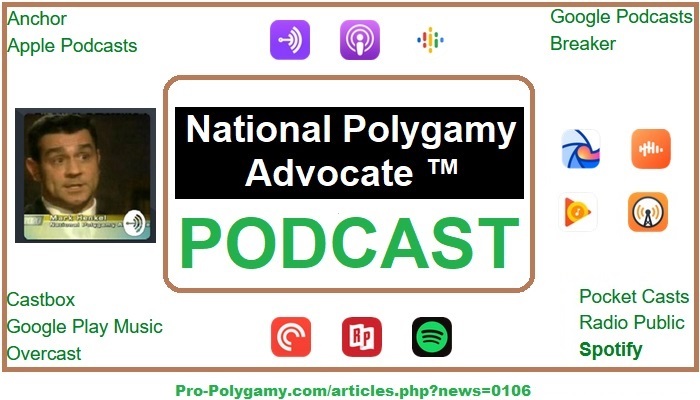 To find and subscribe to the podcast, searchers may simply search the term "national polygamy advocate" on any of the platforms - including iPhone and Android smartphones. On June 26, 2018, with all testing completed, NationalPolygamyAdvocate.com formally announced the podcast to the public. Ten days later, on July 6, 2018, Spotify - a well-known platform - also picked up the podcast. That last addition completed the initial list of the following platforms. On Wednesday, August 1, 2018, the "National Polygamy Advocate ™ PODCAST" aired its 20th posting of media interviews, totaling 5 hours and 16 minutes of listening-time. Dating as far back as the year 2000, dozens and dozens of media interviews have been stored in either one of two forms of recording: analog (audio-cassette) or digital. A decision was made to initiate the podcast using only recordings in the latter form. Past audio-cassette-recorded interviews (of the oldest interviews) will eventually be transferred to digital form and subsequently posted to the podcast too. The list of the initial 20 episodes is comprised of the following posted media interviews, each followed by its respective original on-air date. That initial list includes various interviews from national syndication to terrestrial (traditional radio) stations to internet radio, and more (yes, that means, television). The interviews were hosted and conducted by both women and men on shows that either ranged from liberal to libertarian to conservative or were simply neutral. While most hosts were very respectful, some were rather positive and some others were "not so much." One woman host concluded, "I love it," and two surprised men hosts exclaimed, "Wow!" The podcast serves as (1) an educational resource for students, activists, politicians, and media about the national polygamy rights movement for unrelated consenting adults, (2) a source for rhetoric-training of future advocates of UCAP, Unrelated Consenting Adult Polygamy, (3) a demonstrated example of leadership for the future leaders of the movement, and lastly yet most significantly of all, (4) an important archive for history. With each new episode coming in the weeks and months ahead, not only is the podcast archiving history, but this one-of-a-kind podcast will also be making history too. Indeed, not only are podcast-subscribers hearing archives of history, but they are also becoming a part of history-being-made - just by listening to this first, one, and only "National Polygamy Advocate ™ PODCAST." "National Polygamy Advocate Podcast" is official! Woman host said: "I love it!"